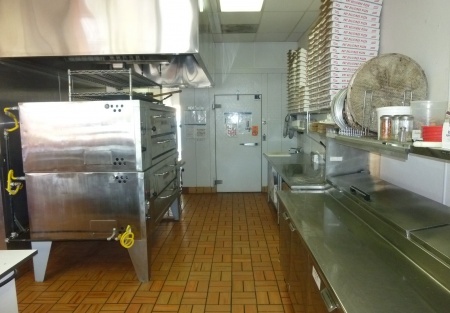 Are you looking for a college area pizza restaurant built out and ready to go? Then here it is ! It is located less than a mile from Grossmont College and approximately four miles from San Diego State University. Owner has remodeled and updated a former Dominos pizza. Located in a very heavy traffic center along with a college bookstore, Starbucks, and a hugely popular gym to draw customers in. The surrounding area has dense residential with lots of condos, apartments and single family homes just across the street. Many large local businesses including Sharp hospital are minutes away and in constant need of catering and daily employee meals. Easy to operate with the small footprint but large demand for product in the area. The space is a well designed and super clean 1200 square feet. Rent is only 2280 per month and even when CAM is included you are only at 2880 per month. The current lease term expires in September of 2012 and there are two three year options available. This location is perfect for a dedicated owner operator to turn the key and hit the ground running. It is not a franchise, but there are several locations around the county you can use for support and volume discounts if you want to keep the same name and operation. Lots of options here, bring your own concept, Mexican, Asian, or simply step up and run the existing Pizza Italian operation as it is. Keep the name or change it, it is entirely up to you. Buy this turn key restaurant at a substantial discount to building your own place, do it now before this opportunity passes you by. Wnat the name and location, then select the golden button titled "want name and location" and you're on your way to owning this great locaiton pizza place. This is a Stone Path Brokerage Services, Inc. DBA Selling Restaurants San Diego listing.